The toughest aspect of the A5 for me to wrap my head around is the driving experience. Why? Because the A5 is a sleek-looking sport coupe, but it doesn't drive like one. While the standard 265-horsepower V-6 has enough power for daily driving — especially in higher gears — it doesn't deliver driving excitement. A six-speed manual transmission is standard, but my test car was equipped with Audi's six-speed automatic with a manual function. Shifting was smooth between higher gears, but during around-town driving, where you're constantly needing those first three gears, it was a bit off-putting, with noticeable delays in upshifts. Shifts came more quickly using the manual feature, but that could get frustrating during long commutes. The A5 is also a slug leaving stoplights, with noticeable hesitation and little initial oomph, so any extra traction the standard all-wheel drive would afford from a dead stop isn't put to the test. The BMW 335i's turbo six-cylinder, on the other hand, consistently offers more gusto. Steering is accurate, but like most Audis there's a lot more play in the wheel than you'd expect; you have to turn the wheel a lot to angle the car where you want it to be. Navigating parking lots requires so much turning it feels like you're driving in a 1980s arcade game. Luckily, because the steering is light, all that turning doesn't put stress on your arms like it would in a BMW. That makes the A5 easier to drive than the BMW 335i coupe, but less fun. The suspension is a mix between sporty and sedate. It's firm enough that you'll notice bumps and other road imperfections, but supple enough for a pleasant highway ride. Depending on your daily drive, the A5 might be more your cup of tea than a more performance-oriented car would be. If you have a mostly highway or suburban commute, this middle-of-the-road ride may be for you. Plus, if you live in a poor-weather climate, the standard all-wheel drive will offer some reassurance. However, if you're a city-dweller like me you'll miss the performance benefits normally gained from a tighter suspension. In fairness, my test car did not come with the optional sport suspension, but I assume it would make it an even a harsher ride. That's always the tradeoff involved in adding more performance. 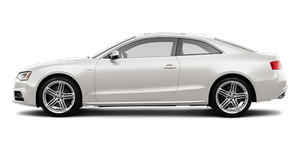 Audi also offers an optional suspension package called Audi Drive Select, which features Dynamic and Comfort modes, for an additional $2,950. That price seems high if you're shopping an A5 versus the performance-oriented S5, which starts at $51,400. Add Audi Drive Select to the A5 and you're only $8,000 away from an S5.